It was, sadly, one of Jerry Goldsmith’s last film scores. Only Timeline and Looney Tunes: Back In Action (both 2003) would follow it. In 2002 Jerry Goldsmith took his final voyage on the fabled USS Enterprise and gave Star Trek Nemesis and the whole Next Generation crew an epic send-off. This is the release so many Star Trek fans have been waiting for. 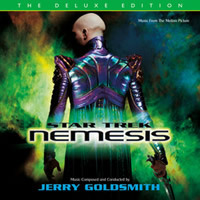 Goldsmith’s complete score from Star Trek Nemesis is presented, along with a set of bonus tracks that includes source music, a set of alternate cues and mixes, plus a rare opportunity to listen in to the final moments of Jerry Goldsmith on the Star Trek scoring stage with his orchestra and director Stuart Baird. In the wake of a joyful wedding between Riker (Jonathan Frakes) and Troi (Marina Sirtis), Captain Jean-Luc Picard (Patrick Stewart) receives another reason to celebrate: the Romulans want peace and the captain will be the Federation's emissary. But as the Enterprise heads toward the Romulan Empire, a brilliant villain awaits — harboring a diabolical plan of destruction and an unimaginable secret that will give Picard his most fearsome challenge. We’re very excited to mark the return of the Varèse Sarabande CD Club with this historic and important Jerry Goldsmith release. CDs will begin shipping the week of January 6.